Home » Whispering Wolf » Fire » What's In A Name? As far back as I can remember, I have made little paper baskets filled with what ever little flowers were blooming on May 1st. I don't remember how it came to happen, perhaps from my Grandpa. Probably my Grandpa. As a child, I didn't really understand the days' importance. Through the years, calling it May Day changed with my understanding of the world around me and I came to know what I had always been celebrating ... Beltane. In my younger school days we learned about the May Pole. Images of children happily dancing around a pole with ribbons. And, I remember trying this a couple times with my younger sisters. What a tangled mess. But, I would always drag my stick with it's tangled ribbon mess up into my room. To me, it looked glorious. It always received a place of honor on my dresser. Another event also always seemed to coincide with Beltane. 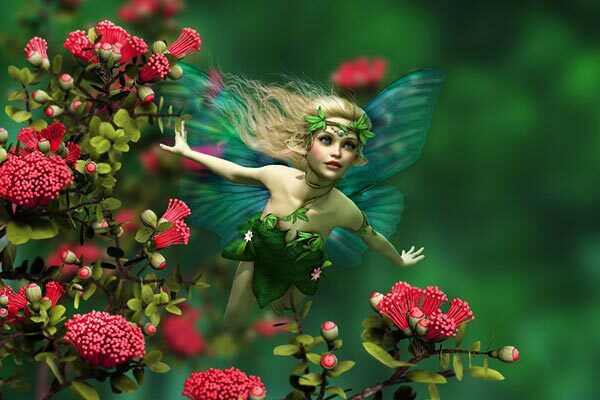 All my summer faerie friends returned from wherever they had disappeared to during the dark winter months. I could hear them giggling as I picked my flowers. I'm not sure how old I was when I also adopted the practice of leaving a saucer of milk with the smallest cookies I could find around its edges. This was my welcome back gift to my fae friends. I knew they would enjoy the sugary feast I left them. Faeries ... I digress. Back to my May Day baskets. I took great care making my baskets. I can remember weaving strips of paper one year. Those were the prettiest baskets I think. And, I would always make two. One to surprise my Mom, and one for Mrs. O'Neill next door. Her husband had passed away when I was pretty young and my sisters and I had kind of adopted her, she was a special lady. I used to go sit with her on a big swing she had in her front yard. It was THE most awesome swing. It hung under it's own little roof out in the middle of her yard and had big cushions to sit on. I would always rush to her house first right after school to bring her my basket. After dangling it from her door handle I would knock, run, and hide behind her bushes. She always acted sooooo surprised and just gushed over my surprise. Then, she would say, 'oh it's too bad I don't know who left this for me. I would ask them to share my lemonade and cookies.' At that point I would pop out from behind the bush and shout Happy May Day, and off we would go to sit on her swing and enjoy our treats. Once as we chatted, very casually, I mentioned that the faeries were back, that I could hear them giggling in the flowers. She, just as casually, replied, 'yes, tonight the yard will be thick as thieves with them and all sorts of mischief will be going on.' I remember feeling very comforted in knowing someone else could hear them too. By this time, if I mentioned it to some of my school friends, it was generally met with an ummmmm, right... kind of comment usually followed up with the 'are you crazy' look. With years flying by, I gained more understanding of the specialness of the day Beltane. It is very Gaelic in its origin. It was the official start of summer. Cattle and sheep were let out into their summer pastures. Many protection rituals were also performed to protect the live stock, people and crops. Later in the day, special bon fires would be lit that people and animals would walk between to receive blessings from the smoke of the fires. Many villages also held the tradition of putting out their ever burning household fires and then re-lighting them from some of the burning Beltane bon fire logs and sticks. Everyone's doors, windows, and even live stock would be decorated with strings of yellow flowers. The yellow flowers of May invoked the aspect of fire, a central theme of this celebration. Celebrations and feasts would occur all over Scotland, Ireland, and many areas of Great Britain and Europe. Like the fall celebration of Samhain, this is a time when the veil of between worlds is the thinnest, called by many, 'the time of no time'. The tradition of flowers at the door was started as an act of protection from all the mischief of the Fairy Folk celebrations. It is the time of year when the earth wakes up and the new growing season begins. And we, her children wake up as well to the beauty spring has brought to the land around us. Fertility abounds in the earth and her people, and many weddings and hand fastings are still held on this day. So, whatever you choose to call it is not the important part I think. Whether it be May Day or Beltane, we can all rejoice in the beginning of another fruitful season of growing.